Superyacht Turquoise is not currently for sale. This story was published September 2011. I’ve just heard that one of the most spectacular launches of 2011, the 54.4m Proteksan-built motor yacht Turquoise has been signed up for sale by Stuart Larsen at Fraser Yachts. With naval architecture and styling by Dubois, this steel and aluminium superyacht offers the ultimate in cruising comfort for up to 12 guests. 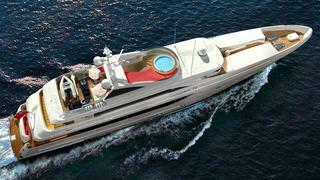 Her exterior combines a purposeful sheer and business-like vertical windscreen with a long, elegant, seagoing bow. With two 1,500hp Caterpillar engines giving a maximum speed of 17 knots, and a 3,500-mile range at 14 knots, this is a yacht built for going places. Her cool and classically modern interior is by HOK Design, and features a spectacular full-beam owner’s suite on the main deck, along with an equally opulent VIP. Four roomy en-suite guest cabins are arranged around a central staircase and lobby. Currently lying in Istanbul, Turquoise is asking €26,500,000.